The newspaper might become less and less of a staple on our lawns or breakfast tables but even the youngest among us can recognize one of its most iconic and colorful stars (and we don’t mean Paul Krugman.) We’re talking about a certain lasagna-loving fat cat with a very heavy disdain for Mondays. ‘Garfield’ may not be as critically revered as iconic favorites like ‘Peanuts,’ ‘Calvin and Hobbes’ and ‘The Far Side,’ but it is without a doubt the most successful comic strip series of all time. It appears every day in a number of newspapers after more than 30 years in syndication, has more than 200,000,000 readers across the globe and creator Jim Davis has reaped countless merchandising rights and profits from toys, phones, T-shirts and others. To celebrate Garfield Day (the strip debuted on June 19th, 1978), here are 11 things you might not know about everyone’s favorite fat orange cat. Garfield’s pop Jim Davis got his professional start in cartooning with the long-running strip ‘Tumbleweeds’ when he got the knack to go at a series of his own. His first creation was a sarcastic bug named “Gnorm Gnat” but he was only able to sell the strip to one paper in his native Indiana. The biggest problem was that editors didn’t think readers could identify with bugs as characters. He took the five years of rejection as a learning experience and scanned the comics’ section to discover they were filled with strips about dogs, but none about cats. Davis’ initial run of the strips included another character who introduced one of its regular faces. Lyman was Jon’s mustachioed next door neighbor and the dog Odie’s former owner. 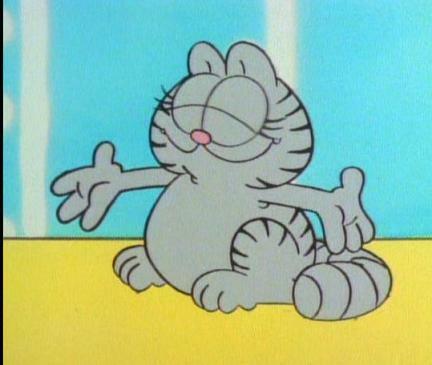 Davis said he needed someone for Jon Arbuckle to communicate with since Garfield couldn’t talk. But he soon found a way for Garfield and Odie to communicate to their owner, thus sending Lyman to the dustbin of forgotten characters along with Garfield’s annoying grey doppelganger Nermal. Davis’ initial drawings of Garfield made him look like a morbidly obese feline than the merely chubby tabby we know and love. His creator wanted to make him more endearing while retaining some of the personality features that earned him so many readers. Three years after Davis created the strip and started syndicating it, he drew the strip at a Hollywood studio shared by animator Bill Melendez who worked with ‘Peanuts’ creator Charles M. Schulz on animated films such as ‘A Charlie Brown Christmas.’ One day, Schulz found Davis trying to draw Garfield and suggested he draw the cat with bigger feet to make him stand on two feet. Thus, the Garfield we know today was born. While far from the oldest comic strip on the newspaper page (‘Gasoline Alley’ has a good six decades on it), ‘Garfield’ is without a doubt the most successful. Sure it has an endless stream of merchandising rights and entertainment spin-offs, but it’s also got the highest readership of any comic strip ever produced, a fact confirmed by the Guinness Book of World Records. Since it started its initial syndication run with the Universal Press Syndicate, ‘Garfield’s’ peak appearance topped out at 2,570 newspapers in 2002. Davis’ work had earned him more than a few spots on the New York Times best seller list with his popular ‘Garfield’ books and national exposure for his work, but he noticed that something was still lacking in the comics section: a title for younger children. ‘U.S. Acres’ starred a bevy of barnyard animals with unique quirks, such as a rooster who overslept and a chick that still walked around in his egg shell. (Artists Bob Scott and Brett Koth also contributed writing and drawing duties.) It only lasted three years in the newspapers, but was adapted for the popular Saturday morning cartoon show ‘Garfield and Friends.’ Classic ‘U.S. Acres’ strips are still published daily on the official Garfield website. Davis also drew a short lived strip based on the classic toy Mr. Potato Head. Thanks to the success of ‘Garfield,’ Davis’ operations are now centralized on a strip of land in his Indiana home in a 50 staff operation called Paws Inc. A portion of these staffers handle the daily strip, according to an interview with the Telegraph. He spends a week writing a bunch of strips at a time and doodling the panels for a team of sketch artists in his ink and lettering departments who put together the final product. Davis has not only established himself as a successful cartoonist, but a successful businessman as well. Since he bought a large portion of the merchandising rights from his syndicate, he parlayed those rights into his Paws business, part of whom handle all of the merchandising rights and prototype designs for various ‘Garfield’ toys, mugs, T-shirts and other products. One of Paws’ bigger projects was a full theme park built in Davis’ native Indiana, a $120 million project filled with ‘Garfield’-themed thrill rides, entertainment venues and water attractions, according to EW. Unfortunately, the idea was scraped and the closest it ever came was a dark water ride called ‘Garfield’s Nightmare‘ at Kennywood, an amusement park in West Mifflin, Pennsylvania.